Gardening is something that you could really enjoy especially if you are a person who loves plants and flowers. Better yet, if you love to eat vegetables, you may also try vegetable gardening. It's really therapeutic and a great stress reliever. Seeing your flowering plants bloom or vegetables garden produce even a little amount of veggies is really rewarding. It's always nice to keep track of good things that happen to you each day and show some gratitude for all these wonderful things that you are grateful for. No matter how bad your day is, you could always find something that you should be thankful for. Keeping a list of these things and reviewing them at the end of each week will help you feel more positive and blessed throughout the coming weeks. Reading a good book will always give you a certain kind of joy. Not only it is very entertaining, it is also one way of exploring your world and getting new knowledge that you could apply in your life. Even reading a good novel will also allow you to separate yourself from the world for a time being and learn valuable lessons from all those wonderful stories. Walking is not only a good form of exercise, it also allows you to appreciate your environment and nature. Focusing on a beautiful tree, plant, flower or animal while you walk will somehow ease your anxiety. It is a great way to relax and get rid of stress or negativity. There's nothing more relaxing than playing with your loyal friends. You would certainly feel comfortable and happy being surrounded by cute and active pets. Nothing is more relaxing than having some stretches. Yoga is a very good way to relax those muscles. Oftentimes, we got so stressed and burn out doing our daily activities at home and it's always best to get rid of those back pains by doing some yoga. There are lots of free yoga exercises that you can download from the internet and you can even do this with your children or spouse. Listening to a good music has always been relaxing. In fact, playing music while cleaning the house, cooking or doing any other household chores will give you extra energy and put you on a happy mood. If you know how to play guitar, that would be good too. You don't have to be a guitar expert nor you need more sophisticated guitar accessories like humbucking. Just play a simple tune that you know and sing to your heart's content and that's enough to relax for the rest of the day. After that hectic day, don't forget to go for an afternoon tea or coffee. Smelling the aroma of your flavorful tea or coffee while sitting by the porch is truly relaxing. You could spend it with a friend or any of your family members while having a good talk. These are the personalized cup cakes we've baked last month. 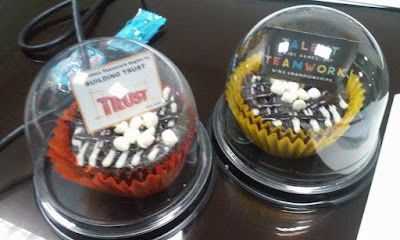 I use these cup cakes as prizes for the activities that I have prepared for the seminar that I've facilitated to some employees of the company who hired my services. I was glad that they were happy with the personalized prizes. Actually, coming up with this is really time consuming especially that there are also materials that I need to prepare for the seminar. I want to give them something unique though and with the intention of integrating the topics that we've discussed during the seminar. 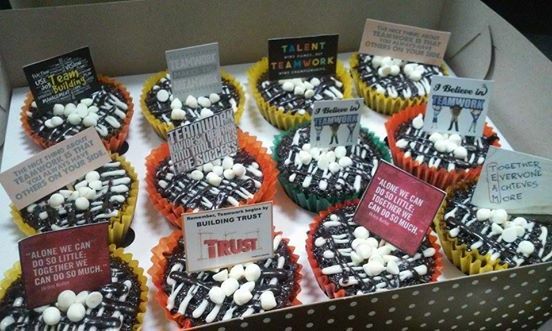 So I thought that personally baked chocolate cup cakes with quotes on team building and work values will be a good idea since we're baking cup cakes for a business anyway. Combining my passions in baking and facilitating seminars is really rewarding as I could explore my creativity and at the same time, motivate and inspire people by sharing to them my personal work and life experiences.